The fiery mountain struck Krynn. The gods shattered the Temple of Istar. One hundred years later, the continent of Ansalon is a desolate land, its people struggling for survival in a world ravaged by plague, starvation, and war. 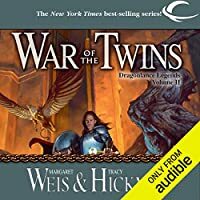 Escaping the doomed city of Istar, Raistlin--now a wizard of great power--casts a spell that brings his twin brother, Caramon, and the cleric Crysania forward to this point in time. Here, in the Tower of High Sorcery, Raistlin intends to enter the Portal and challenge the Dark Queen. But, one by one, Raistlin's plans start to unravel.